Qualification : B.E./B.Tech and M.E./ M.Tech with 1st class or equivalent either in B.E./B.Tech or M.E./ M.Tech from a recognized University „OR‟ B.E./B.Tech and MBA or equivalent with first class either in B.E./B.Tech or MBA from a recognized University. Any branch of Engineering/Technology, Any specialization in MBA. Fee : The application fee will be amounting to Rs.1,000/- in case of UR/OBC candidates and Rs.500/- in case of SC/ST/PH Category candidates. The application fee will be acceptable through online mode only. No other mode of payment will be accepted by the University. The candidates are directed to attach the print out of online fee receipt with hard copy of the Application Form. The candidates are required to fill up the online application form and also send the print out of online filled Application Form with the desired/relevant documents to the Registrar, Delhi Technological University before the last date for receipt of applications, i.e., 21.05.2018. 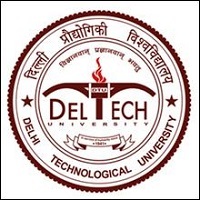 The complete application, in the prescribed form, duly filled in alongwith all the desired documents and requisite fee receipt should be submitted in the University campus at the Reception Counter, Administrative Block on any working day OR sent by post, so as to reach the Registrar, Delhi Technological University, Shahbad Daulatpur, Bawana Road, Delhi-110042 latest by 21.05.2018 at 05.00 p.m.
Labels: Central Government Jobs , Jobs in Delhi Technological University.